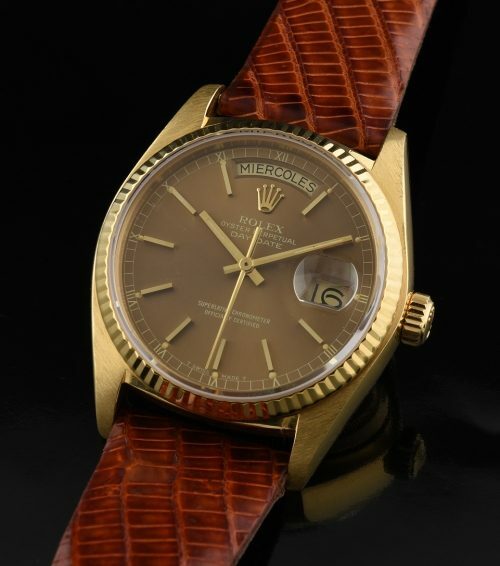 This is a very clean 1977 ROLEX PRESIDENT with a stunning and stellar bronze (original) dial. The solid gold case is without and dings or scratches but does have a very light and hardly readable nostalgic inscription on the case back reading “Gary-Bill Best friends December 1990”. I wouldn’t touch it, as it is barely visible. This date wheel is inetresting-being Spanish. The original 18k. VERY CLEAN bracelet is available for an extra $3000 if desired-it fits a 6.5 inch wrist. The ROLEX automatic winding movement was just cleaned and is accurate. I do love these Rolex Day-Date watches on leather. This dial is a knockout. Just $5950.